Department of Doctoral Studies 1, R. K. University, Rajkot - 360020, Gujarat, India. Raptim Research Ltd., 2 Navi Mumbai - 400710, Maharashtra, India. ABSTRACT: A LC-MS method was developed and validated for determination of ergocalciferol in human plasma. n-hexane was used as extraction solvent while kinetex C18 50*2.1 mm, 1.7µm was used as analytical column for chromatographic separation. Mobile phase was acetonitrile: 0.1% formic acid in methanol (90:10). Turbo ion spray with positive polarity was used as an interface with API QTRAP 5500 LC/MS/MS system. The calibration range was validated for 2.03 ng/mL to 150.69 ng/mL. Limit of quantification was 2.03 ng/mL. The recovery of Analyte was 97.04% to 99.27%. Labeled erythromycin was used as an internal standard for this method. Inter-batch and intra-batch accuracy and precision were calculated to check method’s performance. Stability was established for all anticipated working conditions for analyte as well as internal standard. Apart from stability experiments, other experiments were also performed to simulate the conditions of subject sample analysis. This method was applied successfully on bioequivalence study to evaluate pharmacokinetic parameters. INTRODUCTION: Vitamin D is a fat-soluble vitamin that helps the body absorb calcium and maintain proper levels of calcium and phosphorus in the blood. vitamin D exists naturally in two major forms: vitamin D2 (Ergocalciferol) and vitamin D3 (Cholecalciferol) Fig. 1. Vitamin D2 is derived from plant and fungal sources. Vitamin D3 is derived from animal sources and is produced in skin exposed to Ultra - Violet (UV) radiation from the sun. In the body, vitamin D is metabolized to 25-hydroxy-vitamin D (25-OH-D) in the liver and subsequently to biologically active 1, 25- dihydroxy-vitamin D (1, 25(OH)2D) in the kidneys 1. Vitamin D deficiency is recognized as one of the most common mild chronic medical conditions in the world 2. Vitamin D is either produced in skin (under influence of UV light) or taken up from nourishment. Deficiency of this vitamin has been associated to increased mortality in general population 3 and with several untoward outcomes as myocardial infarction 4, cardiac failure 5, stroke 6, diabetes mellitus, infections and inflammatory and autoimmune conditions 7, 8, 9. Vitamin D regulates the calcium and phosphorus levels in the blood by promoting their absorption from food in the intestines, and by promoting re-absorption of calcium in the kidneys, which enables normal mineralization of bone. It is also necessary for bone growth and bone remodeling. The clinical relevance and immense market potential of ergocalciferol requires a developed and validated bioanalytical method which could be applied for the bioequivalence study of various formulations. 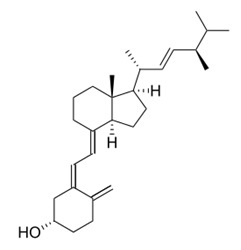 Some of the previous analytical researches performed on this molecule for quantification 10 - 24. F. Ortiz Boyer et al., (1999) determined vitamin D2, D3, K1 and K3 and some hydroxyl metabolites of vitamin D3 in Plasma using a semi-automatic procedure for continuous clean up coupled online with Liquid Chromatography-UV Detection. They used an aminopropyl silica pre-concentration mini-column inserted in sample loop for sample clean up 10. Robert K. Lark et al., (2001) studied diminished and erratic absorption of ergocalciferol in adult Cystic Fibrosis patients. In this method he measured vitamin D2 by using direct Ultraviolet quantitation after separation by HPLC while concentration of 25-Hydroxyvitamin D was measured with a commercially available assay kit 11. Amy K. Saenger et al., (2006) studied quantification of serum 25-Hydroxy vitamin D2 and D3 using HPLC-Tandem Mass Spectrometry and Examination of Reference Intervals for diagnosis of vitamin D Deficiency. The range of quantitation was 1 ng/mL to 100 ng/mL in serum. But in this method significant ion suppression was observed 12. Ahmet C. Goren, Gokhan Bilsel, Mine Bilsel (2007) did simultaneous determination of 25-OH-vitamin D2 and D3 in human serum by LC/MS/MS. In this method, linearity of method was assayed by analyzing five point linear plot in range of 10-500 µg/L which is very high. And validity of this method was not verified on Subject sample analysis 13. Allen Zhang, Robert Kane, Francois Espourteille (2008) from Thermo Fisher Scientific developed a method for analysis of 25-Hydroxy vitamin D3 and 25-Hydroxy vitamin D2 using Turbo Flow Technology. Turbo Flow technology reduces matrix Effect and allow user to directly inject biological fluids into the LC-MS/MS system. But in this method sensitivity level was high 14. M. P. George (2009) from Agilent Technologies developed a method for rapid analysis of vitamin D in serum using Triple Quadrupole LC/MS. Solid Phase extraction method was used to minimize interferences and ion suppression and to enable automation. In this case linearity of quantification was 5-100 ng/mL 15. In present study HPLC-MS/MS method was developed and validated for quantification of ergocalciferol in human plasma and this method was applied for the quantification of ergocalciferol from bioequivalence study after single oral dose of ergocalciferol capsule (1.25mg) versus DRISDOL® (Ergocalciferol) capsules 1.25 mg in 48 healthy adult, human subjects, under fasting conditions. Chemicals and Reagents: Ergocalciferol (molecular weight 396.65; 99.69% w/w) and ergocalciferol D6 (molecular weight 402.65, 100 %) were purchased from Splendid lab and Vivan Life Sciences respectively. K3 EDTA human plasma was procured from Pooja Blood Bank. Other laboratory reagents and chemicals were purchased from Rankem. All chemicals and reagents were used of GR or higher grade. Instrumentation and Analytical Conditions: A Liquid Chromatography system was used (Nexera X2 from Shimadzu Co., Kyoto, Japan) in this method with analytical column having core shell technology (Kinetex C18, 50*2.1mm, 1.7µm from Phenomenex). 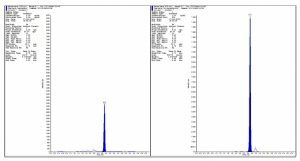 Analyet and Internal standard were ionized and detected with help of triple quadrupole API 5500 LC/MS/MS from AB SCIEX (Toronto, Canada). Ionization of analyte and internal standard were done by using turbo ion spray which was operating in positive ionization mode. Multiple reactions monitoring method was used for quantitation of analyte. 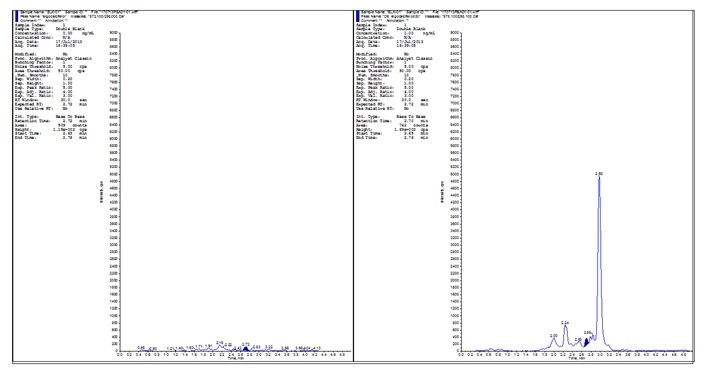 Precursor ion/daughter ion of ergocalciferol and ergocalciferol D4 were 572.1/298.0 and 578.1/298.1. Acquisition and quantitation was done using Analyst software (version 1.6.1). Solutions and Samples: 2 mg of working standard was dissolved in 2 mL of methanol to prepare Ergocalciferol (1 mg/mL) and Ergocalciferol D6 (1mg/mL) Stock solutions. 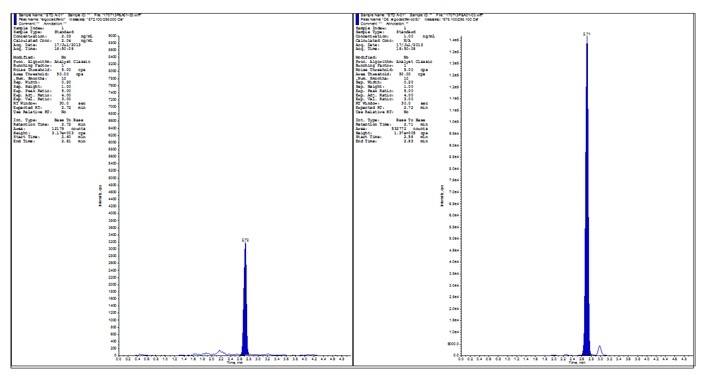 This 1 mg/mL stock solution was further serially diluted in acetonitrile: water (80:20) to make spiking solutions of calibration curve standards and quality control samples. Eight calibration curve standards were prepared by spiking solution in drug free plasma. 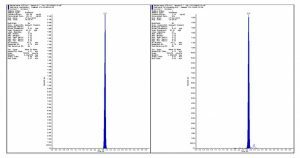 QC samples at levels of 6.10 ng/mL, 30.19 ng/mL, 74.55 ng/mL and 135.55 ng/mL were prepared. All these samples were prepared by bulk spiking and distributed in pre-labelled tubes. All these tubes of calibration curve standards and quality control samples were stored in deep freezer at -20 °C (± 5 °C). During experiment activity 250 μL of sample was pipette out into pre-labelled tubes from these bulk spiked samples. And further processing activity was performed for method validation. Preparation of Mobile Phase: Mixture of Acetonitrile and 0.1 % formic acid (90:20 v/v) was used as mobile phase for pump A and 0.1% Formic Acid in methanol in Pump B. This combination of solvents was run in a gradient program as given in Table 1. Sample Preparation: For sample preparation, eight calibration curve standards and 6 sets of quality control samples were retrieved from deep freezer. Samples were thawed unassisted at room temperature. 250 µL of sample is pipette out into pre-labelled tubes. 50 µL of ergocalciferol D4 was added in these tubes except blank samples, vortexed for 30 sec. n-hexane was used as an extraction solvent so 3 mL of n-hexane was added I each sample and extraction was performed on extractor at 40 rpm for 10 min. Samples were centrifuged at 4500 rpm, 4 °C temperature for 7 min. 2.4 mL of supernatant was separated out in clean pre-labelled tube. This supernatant was evaporated at 40 °C under stream of nitrogen. 75µL of PTAD solution (4-phenyl-1, 2, 4-triazoline-3, 5-Dione) (0.75mg/mL) is added in each dried tube and vortexed for 30 sec. 175 µL of reconstitution solution was added in all samples and vortexed for 30 sec and transferred in pre-labelled autosampler vials. Method Validation: During method validation, precision, accuracy, linearity, sensitivity, selectivity, matrix effect was evaluated. Various stability experiments were performed to mimic the sample handling condition during validation and subject sample analysis. Bench top stability, autosampler stability, dry extract stability, wet extract stability, freeze thaw stability and long term stability were performed as stability experiments. Various other experiments as Haemolysis effect, lipemic effect long batch performance were also performed to evaluate method performance. Ruggedness experiment was also performed for different equipment, different column and different analyst. For method validation activity, guidance was taken from USFDA regulations 25. Selectivity and Sensitivity: Response of analyte in blank sample was compared with response in LLOQ sample to check method’s selectivity. For this experiment six blank plasma, one haemolized and one lipemic plasma lots were taken while six LLOQ samples were analysed to check sensitivity of method. Matrix Effect: This experiment was performed to evaluate inherent variability of matrix for analyte and internal standard. For matrix effect, 06 samples each at concentration of LQC and HQC level were prepared from 6 different plasma lots (Each lot was separated in two aliquots for LQC and HQC). Precision and Accuracy: Accuracy of method was calculated at levels of LQC. LMQC, MQC and HQC in form of ratio of calculated concentration to nominal concentration while precision of method was calculated as coefficient of variation. Calibration curve was plotted for area ratio of analyte and internal standard to concentration of analyte to internal standard. Weighting factor of 1/X2 was used with linear regression. Stock and Working Solution Stability: Long term stock and working solution stability of ergocalciferol and its internal standard were evaluated at 2 - 8 °C in refrigerator while short term solution stabilities were performed at ambient temperature. For solution stabilities, freshly prepared solutions were compared with stability samples. Six aliquots were kept for stability evaluation. Recovery: Recovery was evaluated at three levels of quality control samples i.e., LQC, MQC and HQC. Six blank plasma samples were processed and were reconstituted after drying with aqueous solutions of LQC, MQC and HQC. Response of these samples was compared with extracted samples. Response of internal standard was compared in the same way for recovery evaluation of internal standard. Effect of Concomitant Medication: The effect of potential concomitant drugs i.e. ibuprofen, caffeine, paracetamol and diclofenac, ranitidine on ergocalciferol analysis was performed by spiking mixture of concomitant medication drugs at their approximate Cmax concentration in the LQC and HQC sample in six replicates. Stability Experiments: Bench top stability was evaluated at room temperature on bench for 24 h. Dry extract stability was performed to evaluate stability of dried samples at -20 °C in deep freezer. Freeze thaw stability was evaluated for 5 cycles of freeze and thaw. Plasma stability of ergocalciferol was evaluated for 90 days in deep freezer at -20 °C. Post extraction stability was evaluated at 2 - 8 °C in refrigerator while autosampler stability was evaluated at autosampler temperature for 24 h. For all stability experiments 6 sets of LQC and HQC samples were kept for stability and after stipulated stability duration, 6 LQC and 6 HQC samples were freshly prepared to compare with stability samples for % stability. 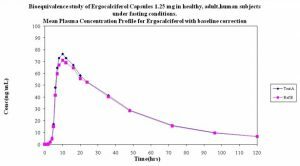 Bioequivalence Study Design: Bioequivalence evaluation was done along with evaluation of pharmacokinetic parameters for the newly developed test formulation of Ergocalciferol 15 mg extended release tablet with the reference 1.25 mg Ergocalciferol formulation in healthy adult, human subjects, under fast and fed condition. Guidance was taken from USFDA guidelines for Exclusion criteria (i.e., allergy to Ergocalciferol, alcoholism, psychosis, smoking, diabetes or any disease which could compromise the haemopoietic, gastrointestinal, renal, hepatic, cardiovascular, and respiratory or central nervous systems. Institutional Ethics Committee (IEC) approved clinical protocol for study design. Aims and risks of study were told to subjects and they provide consent in writing for information. 18-45 years of volunteers were enrolled in study which were having body mass index (18.5 - 30.0 kg/height2) and their physical examination was done with ECG and pathological tests to confirm any abnormality. Blood Samples of both periods were collected in vacuutainers having K3EDTA as anticoagulant. These blood samples were centrifuged as per clinical protocol to obtain plasma samples. These plasma samples were stored at -20 ºC in Deep freezers immediately. Samples from subjects who had completed all periods were taken for analysis. Analyte and Internal Standard: Ergocalciferol and ergocalciferol D6 were both ionized in positive ionization mode. Retention time of analyte and internal standard were 2.72 and 2.71 min respectively. Ergocalciferol and ergocalciferol D6 were showing similar chromatographic behaviour as expected because of labelled internal standard. Ergocalciferol and Ergocalciferol D6 were eluting from analytical column at Retention time (RT) of 2.72 ± 0.3 min and 2.71 ± 0.3 min respectively. Furthermore, as expected ergocalciferol D6 produces similar recovery as of ergocalciferol in the positive ion mode. Positive Electro spray ionization (ESI) was resulting in good efficiencies for both analyte and IS and better sensitivity was achieved for analytical method. Sample Preparation: Good extraction recovery was obtained by using liquid liquid extraction method. n-hexane was found most effective and reproducible among tried organic solvents for extraction with minimum interference. Chromatographic Conditions: Kinetex C18 has shown good chromatographic resolution and sensitivity because of core shell technology. Gradient program was used to isolate peak of interest with other endogenous impurities and metabolic products. Flow rate of pump was from 0.35ml/min to 1.00 mL/min with gradient program and autosampler temperature was set at 10 ± 1 ºC. Selectivity and matrix effect: Analyte and Internal Standard were found free of endogenous interference in all plasma lots including haemolized or lipemic plasma. 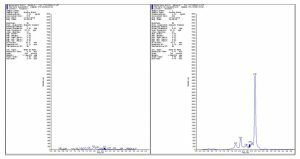 Representative chromatograms of a blank sample, LLOQ sample (2.03 ng/mL) and ULOQ sample are given in Fig. 2, Fig. 3, Fig. 4 respectively. The variability of matrix effect (reported as %CV of LQC and HQC) was 5.42% (HQC) and 5.14% (LQC) for Ergocalciferol. The % mean accuracy of matrix effect samples was 109.34% for LQC samples and 106.48% for HQC samples. These within acceptance criteria results show that ionic enhancement or suppression due to matrix contents were not impacting on quantification of analyte. Linearity and Sensitivity: For the linearity range of 2.03 ng/mL and 150.63 ng/mL, the correlation coefficient (r) was found within acceptance criteria i.e., more than 0.99. Typical equations of calibration curves are as follows: y = a x + b, Where y represents peak area ratio for analyteInternal Standard and x represents concentration of the analyte. Precision and Accuracy: The precision and accuracy of Ergocalciferol at lowest calibration standard (LLOQ) was 2.86% and 110.34%, respectively indicating good sensitivity of analytical method. The intra and inter-day Accuracy and Precision data of Ergocalciferol has been provided in Table 2 along with back calculated concentrations of calibration curve standards. The intra and inter-day accuracy of Ergocalciferol was 105.08-107.54% and 102.82-105.74% respectively and intra and inter-day precision of Ergocalciferol was 1.67% - 4.32% and 1.87 - 4.61% respectively. These results indicate that analytical method is accurate and precise enough to quantitate the analyte of interest. Recovery: The mean % recovery of Ergocalciferol and Ergocalciferol D6 was 97.91% and 97.46% respectively. These recoveries were having precision of 1.22 % and 0.95% for Ergocalciferol and Ergocalciferol D6 respectively. This recovery data indicates that analyte and internal standard were consistently recovered from human plasma with this analytical method. The data of recovery is summarized in Table 3. Stability and Other Parameters: Table 4 represents stability data and which shows that analyte was stable under stipulated handling conditions of sample. Other validation parameters such as ruggedness, reinjection reproducibility, effect of Concomitant drugs, dilution integrity and Long Batch Performance which effect performance of method were found within acceptance criteria. USFDA guidelines 25 were taken as reference for acceptance criteria. 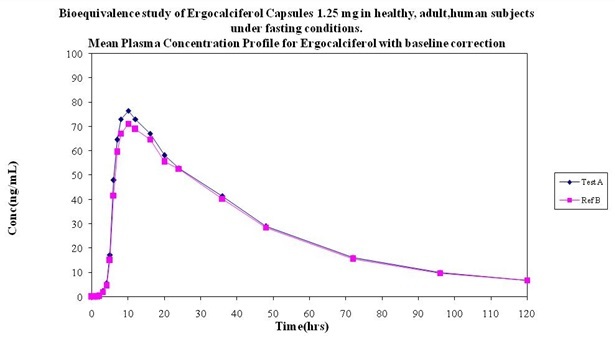 Stability data in different stability conditions for Ergocalciferol has been provided in Table 4. Bioequivalence Study: The newly validated analytical method for quantification of Ergocalciferol was applied to Bioequivalence study to obtain pharmacokinetic parameters. Blood samples were collected in vacuutainers containing K3EDTA as anticoagulant. Pre-dose samples were collected at the time points of -24.00, -16.00, -8.00 and 0.00 hours and post-dose samples were collected at the time points of 1.00, 2.00, 3.00, 4.00, 5.00, 6.00, 7.00, 8.00, 10.00, 12.00, 16.00, 20.00, 24.00, 36.00, 48.00, 72.00, 96.00 and 120.00 h. From the data of both the periods of subjects who completing the study, pharmacokinetic parameters were calculated. Some of the main pharmacokinetic parameters after oral administration of ergocalciferol capsules in human subjects (n = 43) are given in Table 5. The mean plasma concentration versus time profile is shown in Fig. 5. CONCLUSION: For the very first time a highly sensitive and selective method for the quantitative determination of ergocalciferol in human plasma was developed using HPLC-MS/MS with turbo-ion spray in positive ion mode. The method was validated as per USFDA guidelines and applied to subject sample analysis in Bioequivalence study. This method allows for a much higher sample throughput due to the shorter chromatographic run time (5.0 min) in comparison to all published literature till now. The method has been successfully used in a PK study of orally administered ergocalciferol capsules. ACKNOWLEDGEMENT: Authors are thankful to Dr. Rajen Shah, Director, Raptim Research Ltd., for his continuous support and encouragement. 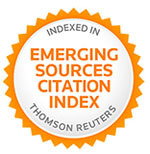 The authors gratefully acknowledge of Raptim Research Ltd., for providing necessary facilities to carry out this work. Holick HF: Vitamin D deficiency. N. Engl. J. Med 2007; 357: 266-281. Melamed ML, Michos ED and Post W: 25-hydroxyvitamin D levels and the risk of mortality in the general population. Arch. Intern. Med 2008; 168: 1629-1637. Giovannucci E, Liu Y and Hollis BW: 25-hydroxyvitamin D and risk of myocardial infarction in men: a prospective study, Arch. Intern. Med 2008; 168: 1174-1180. Pilz S, März W and Wellnitz B: Association of Vitamin D deficiency with heart failure and sudden cardiac death in a large cross-sectional study of patients referred for coronary angiography, J. Clin. Endo. Metab 2008; 93: 3927-3935. Pilz S, Dobnig H and Fischer JE: Low vitamin D levels predict stroke in patients referred to coronary angiography. Stroke 2008; 39: 2611-2613. Danescu LG, Levy S and Levy J: Vitamin D and diabetes mellitus, Endocrine 2009; 35: 11-17. Pappa HM, Grand RJ and Gordon CM: Report on the vitamin D status of adult and paediatric patients with inflammatory bowel disease and its significance for bone health and disease, Infla. Bowel. Dis 2006; 12: 1162-1174. Arnson Y, Amital H and Shoenfeld Y: Vitamin D and autoimmunity: new aetiological and therapeutic considerations. Ann Rheum Dis 2007; 66: 1137-1142. Ortiz Boyer F, Fernandez RJM and de Castro LMD: Determination of vitamin D2, D3, K1 and K3 and some hydroxyl metabolites of Vitamin D3 in Plasma using a continuous clean up pre-concentration procedure coupled online with Liquid Chromatography-UV Detection. Analyst 1999; 124: 401-406. Lark RK, Gayle EL and David AO: Diminished and erratic absorption of ergocalciferol in adult cystic fibrosis Patients. The Americal Journal of Clinical Nutrition 2001; 73: 602-6. Saenger AK, Laha TJ and Bremner DE: Quantification of serum 25-Hydroxy Vitamin D2 and D3 using HPLC-Tandem Mass Spectrometry and Examination of Reference Intervals for Diagnosis of Vitamin D Deficiency. Am. J. Clin Pathol 2006; 125: 914-920. Goren AC, Bilsel G and Bilsel M: Rapid and simultaneous determination of 25-OH-vitamin D2 and D3 in human serum by LC/MS/MS: Validation and uncertainty assessment. J. Chem. Metrl. 2007; 1: 1-9. Zhang A, Kane R and Espourteille F: A quantitative, efficient method for analysis of 25-Hydroxy vitamin D3 and 25-Hydroxy vitamin D2 using turbo flow technology. Application Note-Thermo Fisher Scientific Inc 2008; 416: 1-4. George MP: Rapid Analysis of vitamin D in serum using Triple Quadrupole LC/MS. Application Note-Agilent Technologies Inc 2009; 1: 1-4. French D: Rapid LC-MS/MS method for Vitamin D analysis (25-OH Vitamin D2/D3). Advance Webinar-University of California San Francisco 2011; 1: 1-27. Sudsakorn S, Phatarphekar A and O’Shea T: Deter-mination of 1,25 dihydroxy vitamin D2 in rat serum using liquid chromatography with tandem mass spectrometry. Journal of Chromatography B 2011; 879: 139-145. Slawinska A, Fornal E and Radzki W: Study on Vitamin D2 stability in dried mushrooms during drying and storage. Food Chemistry 2016; 199: 203-209. Jumaah F, Larsson S and Essen S: A rapid method for the separation of Vitamin D and its metabolites by ultra-high performance supercritical fluid chromatography-mass spectrometry. Jou of Chromatogra A 2016; 1440: 191-200. Gentili A, Miccheli A and Tomai P: Liquid chromatography-tandem mass spectrometry method for the determination of vitamin K homologues in human milk after overnight cold saponification. Journal of Food Composition and Analysis 2016; 47: 21-30. Jenkinson C, Taylor AE and Hassan-Smith ZK: High throughput LC-MS/MS method for the simultaneous analysis of multiple vitamin D analytes in serum. Journal of Chromatography B 2016; 1014: 56-63. Gomes FP, Shaw PN and Hewavitharana AK: Determination of four sulfated vitamin D compounds in human biological fluids by liquid chromatography-tandem mass spectrometry. Journal of Chromatography B 2015; 1009-1010: 80-86. Hassan-Smith Z, Jenkinson C and Taylor A: Use of high-throughput liquid chromatography mass spectrometry to measure association between Vitamin D metabolites and body composition and muscle mass: a cross-sectional study. The Lancet 2016; 387: S50. Trineeva OV, Safonova EF and Slivkin AI: Optimum parameters for ergocalciferol determination by thin-layer chromatography. 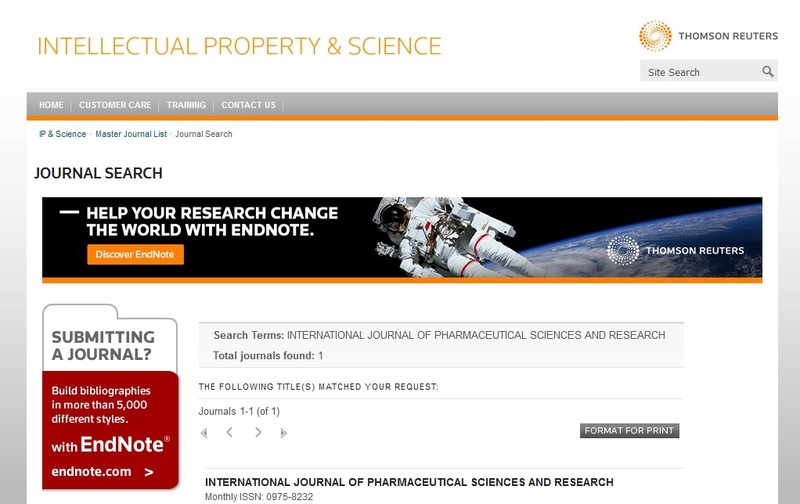 Pharmaceutical Chemistry Journal 2013; 47: 121-123. Guidance for Industry. Bioanalytical Method Validation. U.S. Department of Health and Human Services Food and Drug Administration, Center for Drug Evaluation and Research (CDER) and Center for Veterinary Medicine (CVM). Rockville, MD USA 2001. 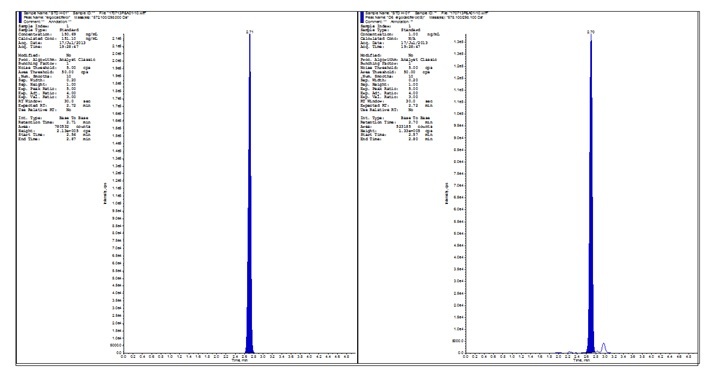 Tiwari A, Dawkhar B, Bagul M and Goswami S: Development and validation of a Liquid Chromatography-Electro-Spray Ionization-Mass Spectrometry method for the quantitation of ergocalciferol in human plasma. Int J Pharm Sci & Res 2018; 9(9): 3863-69. doi: 10.13040/ IJPSR.0975-8232.9(9).3863-69. Authors Address: Department of Doctoral Studies, R. K. University, Rajkot, Gujarat, India.